So, you’ve probably been told time and time again that diabetes has no cure, and what diabetics should not eat. Certainly, you must have found yourself terribly disheartened by these words. While the information is true, it does not necessarily mean that you cannot try to control diabetes by different means. 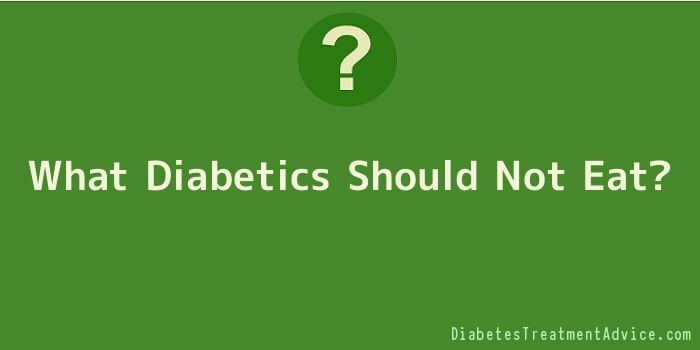 While it is most common to treat diabetes using medication, this alone would not help. You would also need to keep your diet in check or may even have to completely change your daily diet so that it includes foods that are beneficial to a diabetic. Now, we know how frustrating all this sounds but let’s look at the brighter side. Controlling your diet does not have to become a torturous process. So what’s the solution? Adjust your lifestyle a little bit so that what is healthy becomes your way of life rather than a stressor that you place on life. If you have always wanted to do this but have been unsure as to how to get started, this article is for you. The food that a diabetic must not eat can be categorized under different headings, the main one’s being vegetables, fruit, meat, dairy products and food rich in starch. While most diabetics only tend to think of keeping away from food rich in sugar, they fail to realize the impact starchy foods can have on his/her blood sugar levels. This obviously means that all types of bread, pasta and rice made out of white floor must be avoided. Keep in mind that some foods that are okay for a diabetic may fall under the “what diabetics should not eat” group because of the way it has been prepared. While some fresh fruit may be good for you, the same fruit in canned form with syrup will be bad. Similarly, certain vegetables that are beneficial when eaten raw or boiled may not be all that great for your health if cooked in butter. So as you can see, just because you are diabetic, you are not shunned away from the delights of food land miracles; it is just that, you should now adapt to a different dish, or a different form of most of the same food you previously enjoyed. When choosing dairy products you must always avoid items that are non low-fat or whole. This should be followed for all types of milk, cream, cheese and even yoghurt. Since dairy products contain calcium and important proteins, you mustn’t avoid them completely, but rather watch your intake. Most fast foods in general, are best avoided by diabetics as this not only affects blood sugar levels but will also lead to problems with cholesterol levels. These foods include French fries and fried meats that generally accompany them. It’s important to consider other health conditions you may have as well, because this would ensure that your diabetes does not lead to further complications. Almost all food items mentioned here as needing to be avoided are not only risky foods for diabetics but the types that help keep other diseases at bay. In addition to maintaining your diet and being careful about what diabetics should not eat, you must also look to exercise regularly. This would mean that you also need to incorporate a good fitness routine into your life, as all these aspects need to go hand-in-hand if you are to see the best results in terms of lower blood sugar levels. While there are numerous exercises that would help diabetics, it’s always best to seek medical advice with regards to both your diet and fitness routine, as a doctor would be the best guide, and knows what would be ideal given your particular circumstances. So take it easy and look at the positive life. Treat your life as a diabetic as a new wave passing over your life and enjoy the ride, the best way you can.